Make your favorite dinosaur lovers special party prehistoric, with this Dinosaur Happy Birthday Party Card. This happy, golden eyed brachiosaurus has hung a banner of flags, and is wearing the fanciest party hat available, because this dinosaur is as big a fan of you, as you are of dinosaurs! 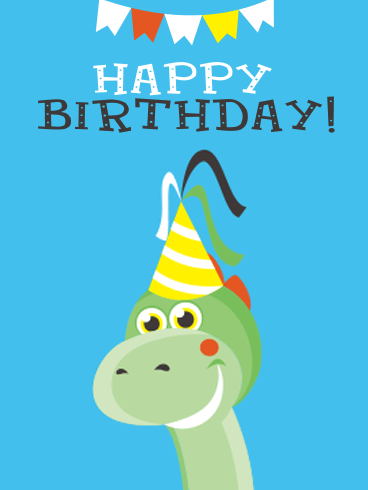 Make the day great by letting this cool blue background and mossy green party animal say Happy Birthday, today! Let your grandson know how proud you are of his intelligence and creativity! Telling him how brilliant you think he is on his special day will definitely put a smile on his face. 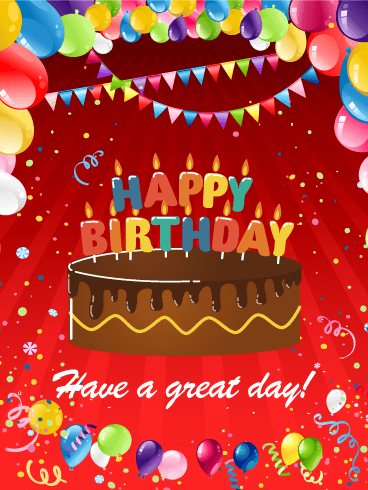 Do not miss the opportunity to wish your grandson a very happy birthday by sending him this birthday card today! Turning nine and feeling fine! Rainbow confetti rains down from the top of the birthday card, around the Happy Birthday message and continues all the way down to the banners that decorate the bottom! A blue-striped 9 birthday cake candle proudly sits atop a pink-frosted, double layer birthday cake making this Happy 9th Birthday Card suit-able for either a girl or a boy's birthday. 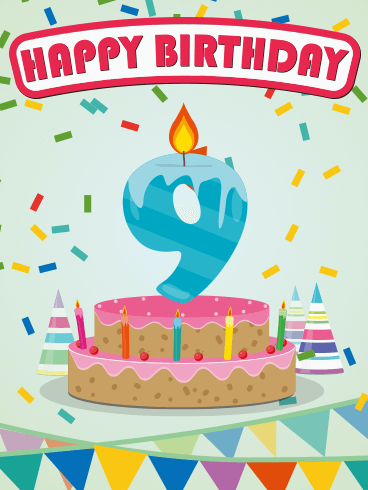 Make any kid's ninth birthday more exciting by sending them this party of a birthday card! Colorful streamers hang from above, bringing a fun, festive touch to this birthday card for a special nephew in your life! And the And the greeting below will put him in the mood to party the night away! Whether you're celebrating together, or sending wishes from across the miles, it's a great way to surprise him and let him know how much you care. Presents, confetti, and streamers fill this birthday card with excitement and cheer, making it perfect for your father's big day! It features colorful gift boxes that will certainly have your father looking forward to the birthday presents he will be receiving. It also displays a special message that wishes your father a wonderful day! 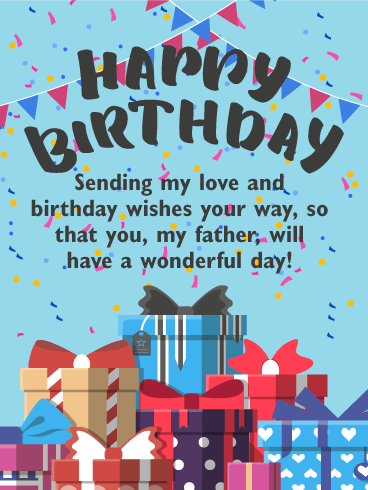 This festive birthday card will bring joy to your father and get his birthday started in a great way! Birthday's are the perfect excuse for a party. Release the balloons, pop open the confetti, and have a good time. 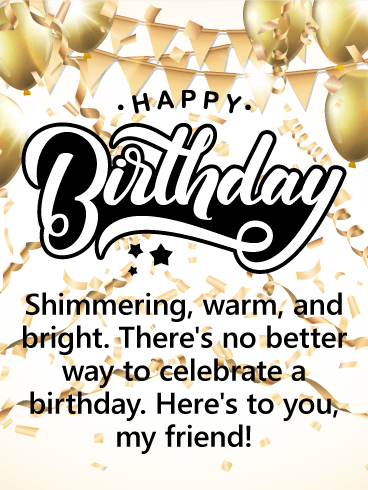 Make sure your friend has a fabulous birthday this year with this party card. Let them know they deserve the best and that you're celebrating just as hard on their behalf. You may not be lighting the birthday candles, but you're giving your friend a birthday wish all the same. Shimmering decorations, bright smiles, and the warm feeling of being surrounded by friends are the requirements of every good birthday party. Make sure that this year, your friend has each of the required elements by sending them this golden birthday card! 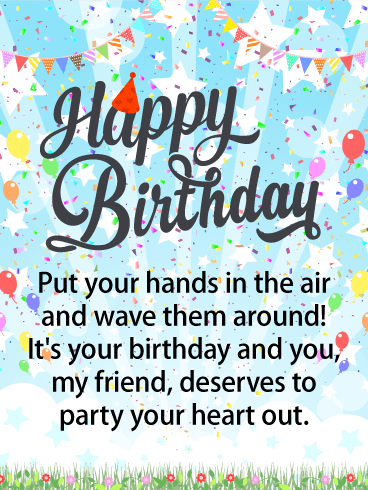 Wish your friend an amazing birthday and help them celebrate the right way! Make your mother a happy woman with this colorful birthday card! Birthdays are the best celebrations, focusing a bunch of positive energy on a single person. 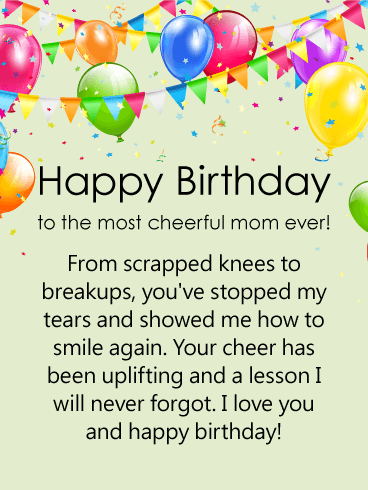 Make sure your mother feels your love by sending her this card full of birthday wishes. Send her your thoughts, wish her the best day possible, and let her know that she will always have a large part of your heart. Streamers, balloons and confetti bring lots of festive touches to this thoughtful birthday card for your uncle. It's a day to celebrate him to the fullest, while wishing him an amazing year ahead. He's sure to appreciate your sentiments, whether you're right there celebrating with him or thinking of him from across the miles. 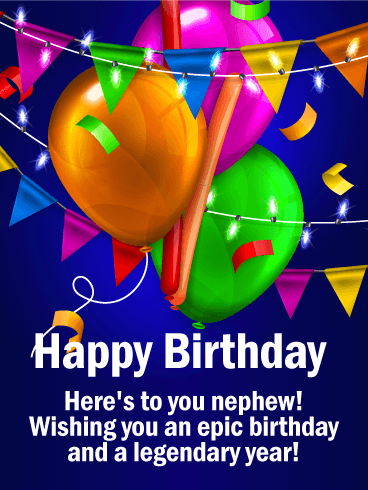 Wish your nephew an epic birthday and a legendary year with this colorful birthday balloon greeting card! 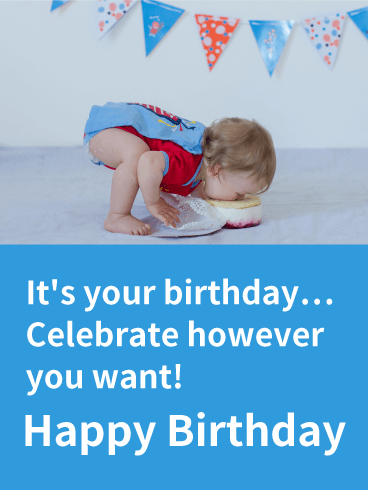 This birthday greeting card is a party in itself, so send it to your amazing nephew for a really fun start to his special day. 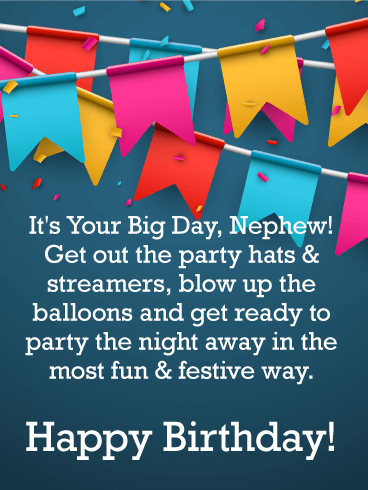 Celebrate your nephews birthday with a fun birthday message that is super easy to send today! He will love it! Eat a slice for me! 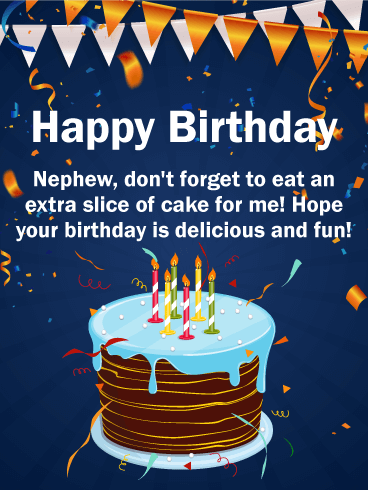 If you can't be with your nephew on his birthday, then make sure to send him a fun birthday card to remind him to enjoy an extra slice of cake for you! 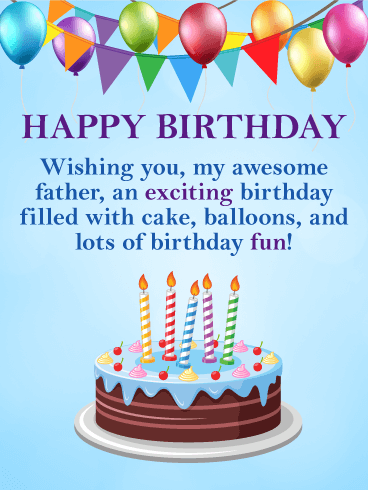 Take a quick minute to send your awesome nephew a cool birthday greeting card to make his day and wish him a delicious and fun time. If you are looking for a decorative birthday card that will get your sister excited about her birthday, look no further! This great birthday card is filled with color and celebration elements that are perfect for your sister's special day! It features birthday gifts with ribbons, colorful balloons, confetti and streamers! It was designed with unique lettering displayed in many colors. Very festive! Pug birthday cards really can't be beat. They are hilarious and adorable. 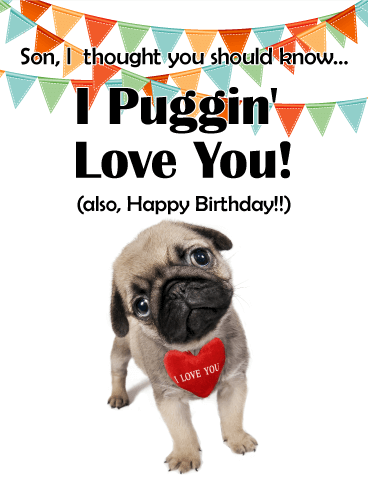 Send this funny birthday card to your son today and let him know how much you "puggin'" love him! Your son is the best, your favorite, one swell dude! Send him the kind of fun birthday greeting he deserves with this silly and clever birthday card. Very little is needed to make a happy life---just pugs and hugs, am I right? The world looks pretty different today than it used to when your son was a kid. 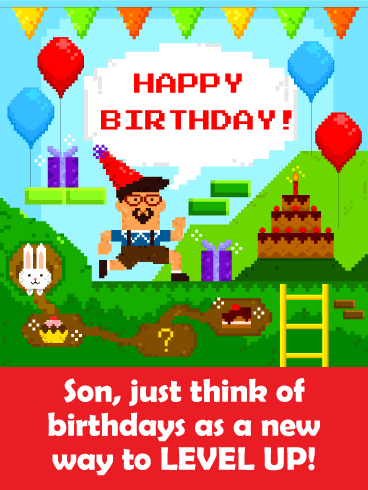 Send this pixelated happy birthday card to your son on his birthday. 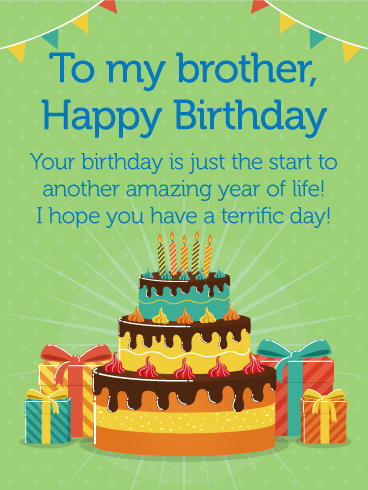 Wish him a terrific day with a funny card. Your son has seen many birthdays but there is no reason to be sad about getting older. 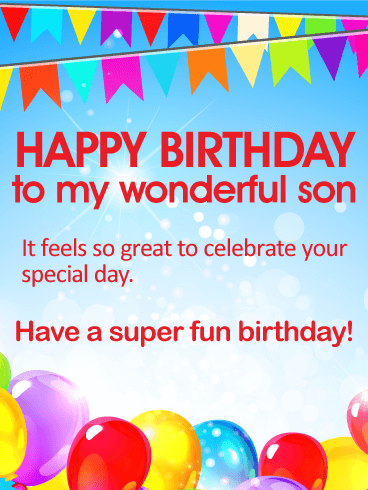 This birthday greeting card reminds your son that every year is just another chance to Level UP his life! 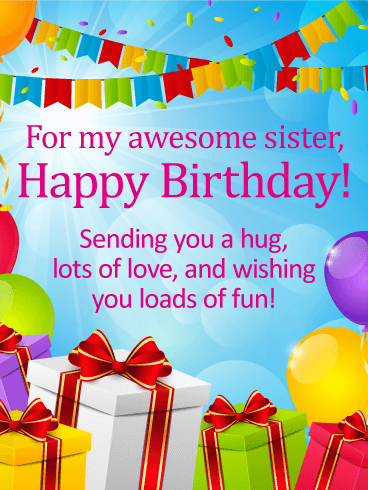 This wonderful happy birthday card will really touch your sister. The saying, "There's no friend like a Sister, and no Sister quite like you", will let her know how very special she is to you. It features festive colorful birthday streamers and confetti, perfect for your sister's special day! 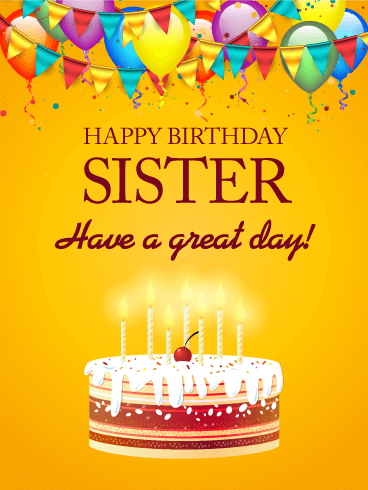 Send this lovely birthday card to your sister today to make her birthday a memorable one! What's sweeter than a little chick with a party hat? How about a little chick with a party hat standing next to a fabulous, candle-topped cake! 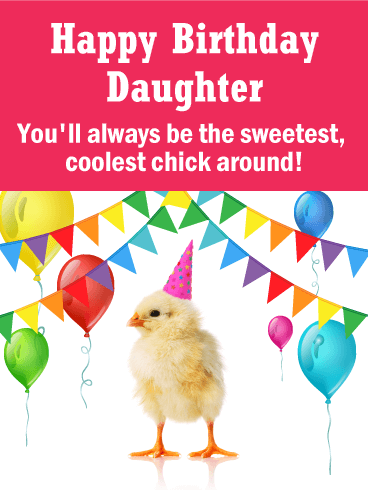 Put these two things together and you've got the perfect birthday greeting for the coolest daughter around...yours! If she's not thrilled about the number of candles on the cake, this playful card will have her laughing so hard, she'll forget about how old she's turning! 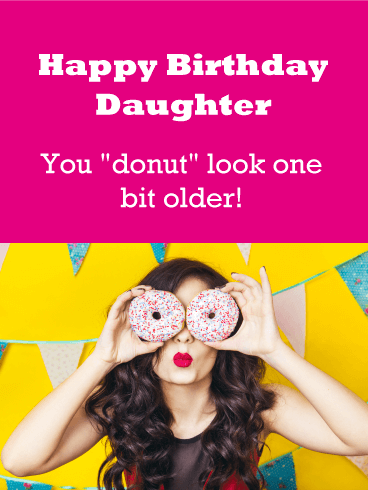 With bright, fun colors and a party girl sporting two sprinkled donuts around her eyes, it's a silly way to wish her a sweet celebration, while reminding her she still looks young in your eyes. This festive happy birthday card will certainly get your son excited about his special day! 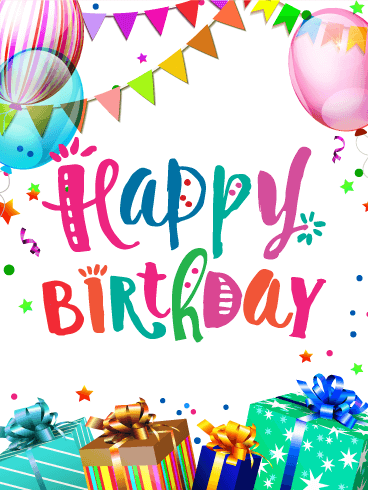 It includes birthday balloons and celebration streamers, as well as colorful happy birthday lettering that make this card so very special. 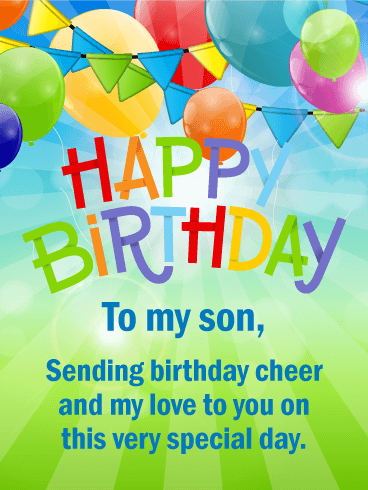 It will allow you to send your love and some birthday cheer your son's way to make sure he knows you are thinking of him on his birthday! If you are looking for a nicely decorated birthday card for your son, you just found it! This happy birthday card wishes him the great birthday he deserves. 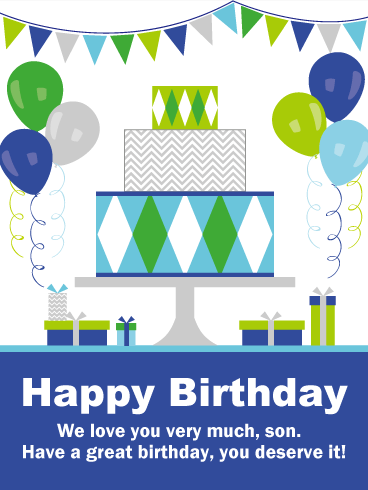 It features a birthday cake, balloons, and presents created with terrific shades of blue and green. Your son is going to really like this birthday card, but most of all, he will love that it is from you. 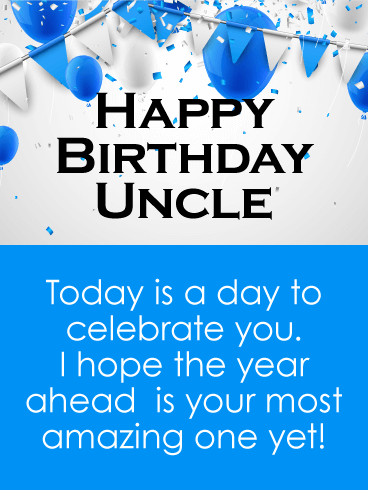 Your uncle is awesome, and on his birthday you want to let him know. It's time to celebrate him and wish him well in the year ahead. 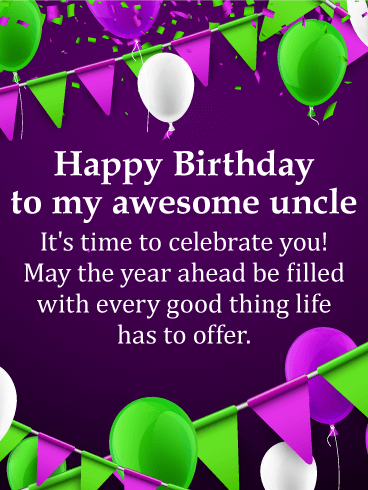 This birthday card does that in style with purple and lime green banners hung and matching balloons floating through the air. 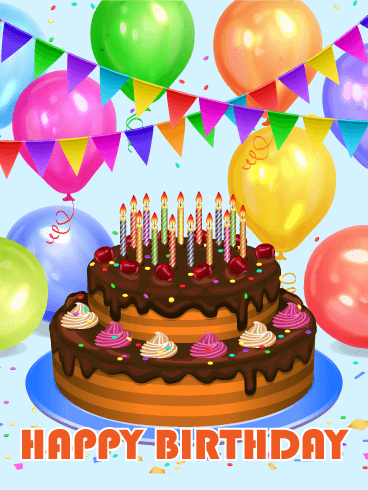 The celebration scene of this birthday card is on a dark purple background. It's your friend's birthday, and that makes it the perfect reason to celebrate! 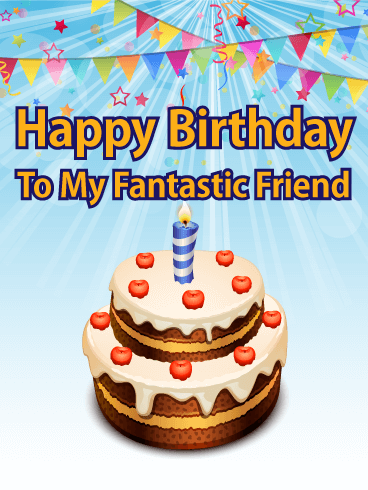 Enjoy a piece of cake, and let her know what a fantastic friend she's been to you. 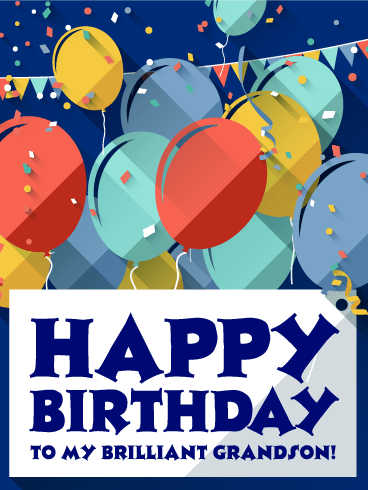 This birthday card is ready for a party with banners and streamers on a sky blue background. It features a delicious cake, complete with a birthday candle, ready to be enjoyed. 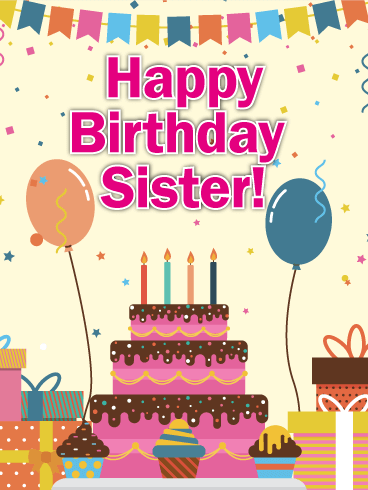 Celebrate your sister's birthday right with a festive birthday card! You've held tea parties and random picnics, fashion shows and movie nights, but birthday parties are the best activities in the world. 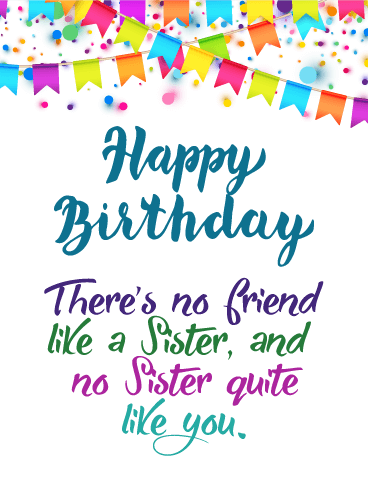 Jump start your sister's birthday by gifting her this amazing birthday card. It's the perfect party from you to her! Satisfy your sister's sweet tooth on her birthday! This irresistible layered cake is the perfect treat, made all the sweeter for being delivered by such a good sister as you. You might have attended every party when you were younger, but sadly you can only attend in spirit now. But such a cute card makes up for the distance. 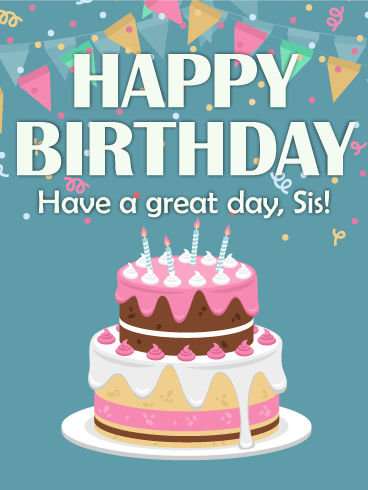 Send this birthday card and tell your sister "happy birthday"! Love only deepens over time. 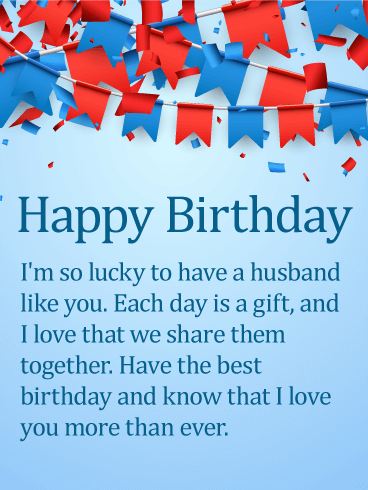 On your husband's birthday, send this sentimental and sweet birthday card to let him know you love him more than ever. Tell your husband how lucky you are to have him by your side; he will love the thoughtful gesture and smile at the sweet words. 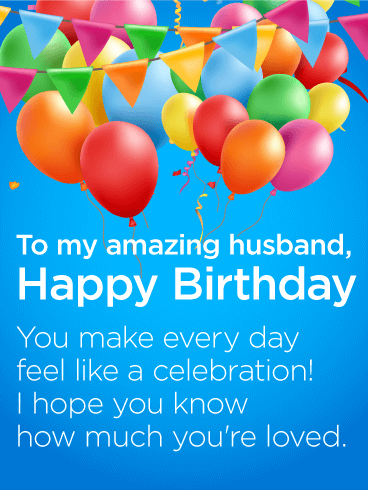 Send this heartfelt birthday card to your husband today. Life is an adventure. How lucky we are if we get to share it with the one we love. 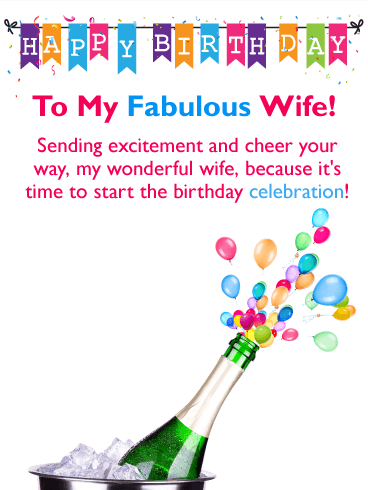 Send your husband a fantastically fun birthday card and message. Let your husband know you're so happy he was born! And, even happier that you get to do life together. 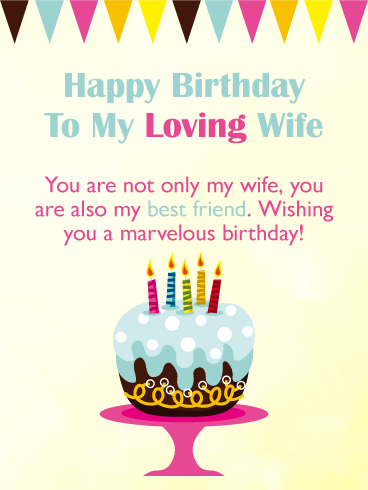 A birthday card is a great way to shower your husband in love and warm fuzzies. That's right, we said it. Warm fuzzies. Balloons and streamers. A cake topped with candles. Warm wishes for an incredible celebration. These are all the special ingredients that go into creating the perfect birthday for your sweet sister! This festive birthday card was designed to make her smile bright, knowing how much you care, today and always. Chocolate cake! Balloons! Streamers! Confetti! What more could the person in your life celebrating a birthday ask for?! The bright colors make this birthday card tons of fun, and it's sure to bring a smile to anyone's face. From a colleague to a close friend, this birthday card is can't-miss for anyone's birthday. This birthday card is the perfect combination of style and simplicity. The pastel colors fit really well together, while the verbiage is simple and easy to customize. Just look at that delicious cake! Even the colors on the cake are stunning. 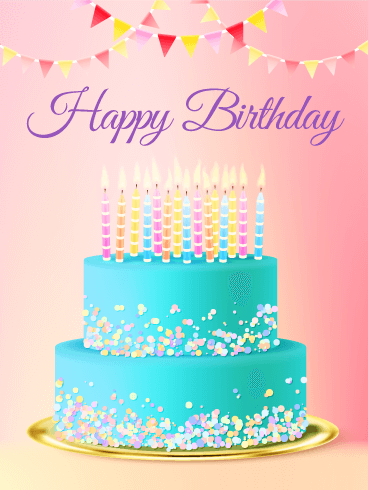 From the soft pink background, to the pastel-colored sprinkles on the cake, this birthday card is simply fabulous. Colorful streamers and confetti. A beer mug topped with blazing candles. What else could "the most wonderful guy" ask for on his birthday? This festive birthday card is great to send to any special man in your life, especially if he's celebrating a milestone birthday like 21, 30 or 40. 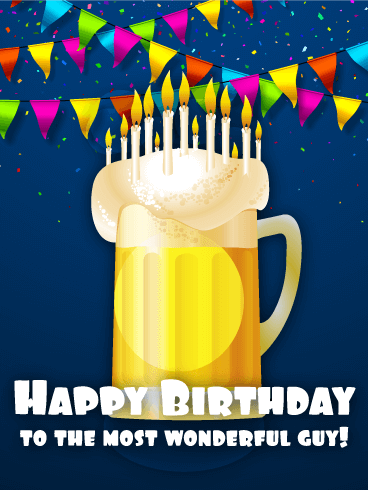 It will let him know you're wishing him well and hoping he has a day full of fun and partying ahead! 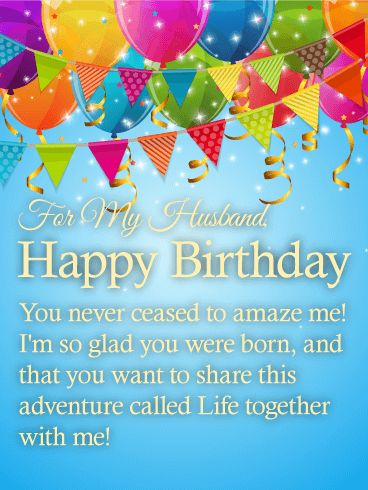 An endless array of colorful balloons and streamers sets a festive tone for this birthday card to your amazing husband! It's a call for him to celebrate his day in the biggest and best way possible while always remembering how much he's loved every single day! Colorful banners, balloons, packages, and confetti what more could a sister ask for on her birthday? Your sister will most certainly appreciate this birthday card and that you remembered her on her most special of days! This birthday card is bound to brighten any son's day. 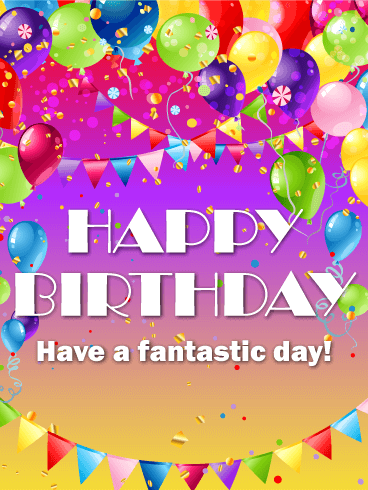 Who would not be excited to see this fun and cheerful birthday card arrive in their inbox? The uplifting and supportive birthday card is perfectly matched to the playful and motivating image of balloons and flags. This birthday card is perfect to send to a son of any age. No one is too old to enjoy playful balloons and banners of flags on their birthday. 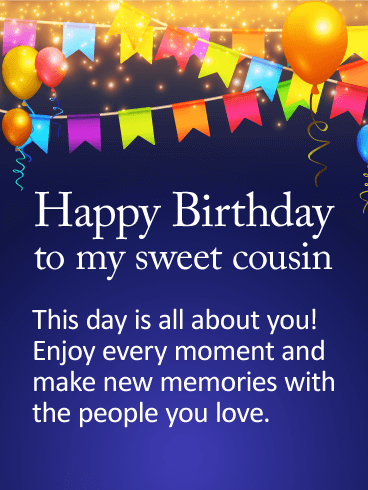 For a special cousin whose birthday is coming up, this heartfelt birthday card is a wonderful choice. It's a chance to tell them how much they mean to you, not just on this one day, but every day. A background party setting of balloons and colorful flags will get them in the mood to celebrate, as they "make new memories with the people they love"...especially you!